The only installation step required is profiler COM class registration. 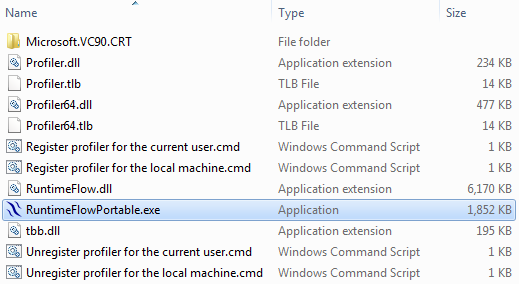 If you don’t have admin rights and you only need to monitor applications under the current account, run “Register profiler for the current user.cmd”. If you have admin rights, it is recommended to run “Register profiler for the local machine.cmd”. When no longer needed, you can unregister the profiler with the appropriate “Unregister…” script. Runtime Flow portable requires .NET 3.5 SP1 to be installed (or .NET 3.0 plus VS 2008 C++ runtime) when running on Windows XP and Vista. On Windows 7 no additional components required. Download link: Runtime Flow portable v1.2.1.